Mission San Fernando Rey de España is located in Los Angeles' San Fernando Valley. It's the only California mission that's actually within Los Angeles city limits. Greater Los Angeles has two Missions: Mission San Gabriel Arcángel and Mission San Fernando Rey de España. Mission San Gabriel Arcángel is actually located much closer, less than 10 miles, from downtown Los Angeles. However, it's outside of Los Angeles city limits and located in the city of San Gabriel. 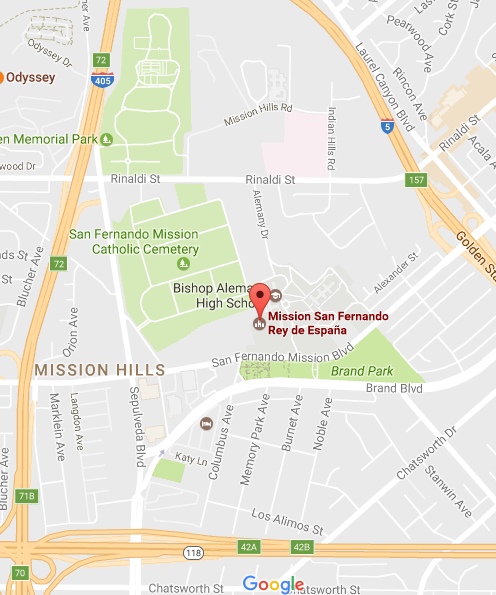 Meanwhile, Mission San Fernando Rey de España is located 23 miles away from downtown - but is still within Los Angeles city limits. I was in Los Angeles earlier this Spring, spending time with co-workers at USC. Above, the intersection of the Harbor Freeway and the Century Freeway (more commonly known as the 110 and the 105 Freeways, respectively) south of campus. Seen La La Land? This is where the opening scene of La La Land was filmed. 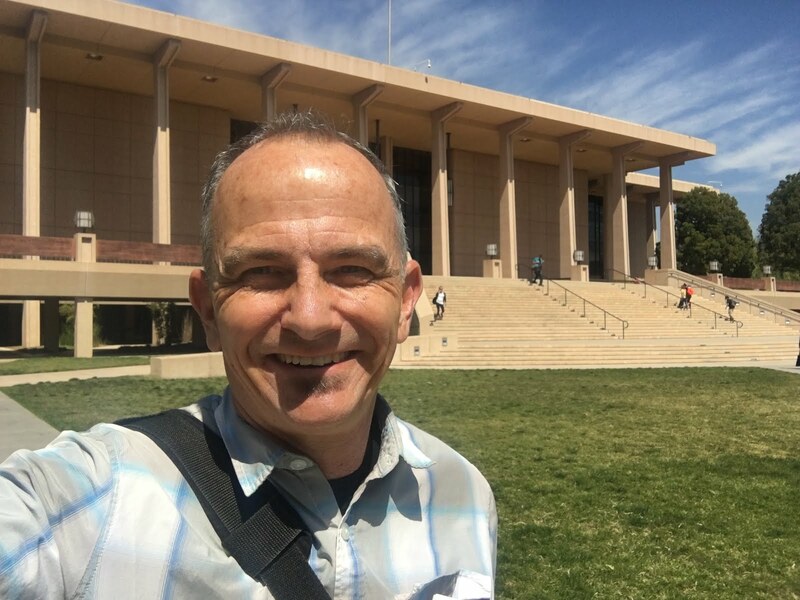 After breakfast with some former co-workers in Playa del Rey, I headed out to Cal State Northridge in the San Fernando Valley. Cal State Northridge is one of several communities in Los Angeles' massive San Fernando Valley. I say Los Angeles' because most of the San Fernando Valley, usually referred to as "the Valley," is part of the city of Los Angeles. Outside CSUN: Cal State University Northridge. I had some appointments with a few faculty members. On campus I walked by the CSUN campus library. If it seems slightly familiar, it's been featured in such films as Star Trek and Sky High. Afterwards, I had some time before heading home. I've driven by Mission San Fernando numerous times, but had never actually gone inside. Plus, what in the world was the "Bob Hope Memorial Garden"? 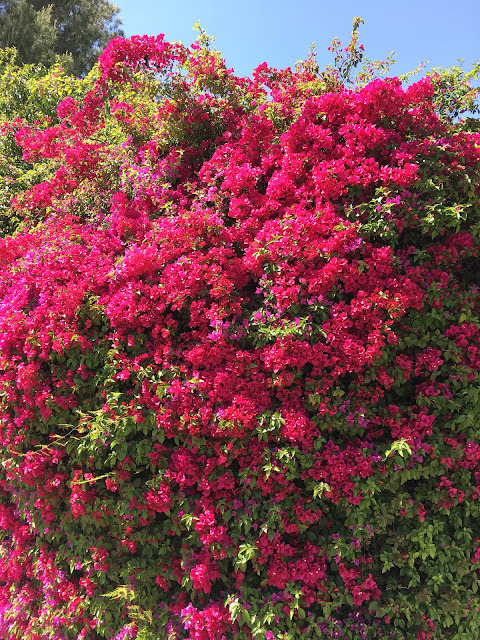 HUGE bougainvillea near the entrance. As I shared in the previous post, I love this plant. While the Mission grounds are open as a museum, it also has a functioning church. Enter through the gift shop. There is a nominal $5 charge to see the grounds, church, and museum. 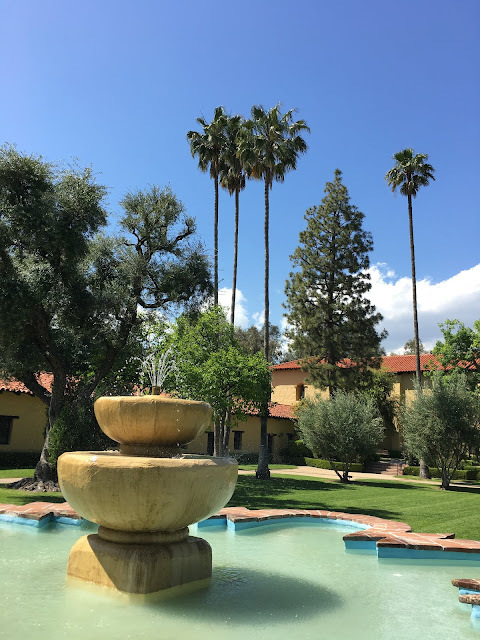 Founded in 1797, Mission San Fernando Rey de España is the 17th of the 21 California Missions. Much of the Mission serves a museum. Lots of displays on both the Mission and the larger scope of the California Missions. The 1985 US Postage stamp honoring Junípero Serra, the Catholic priest who founded the first nine of the California missions. The obligatory "Isle of California" map. This one is from 1650. By the time the Mission was founded in 1797, Spanish (and other) explorers had updated the map. 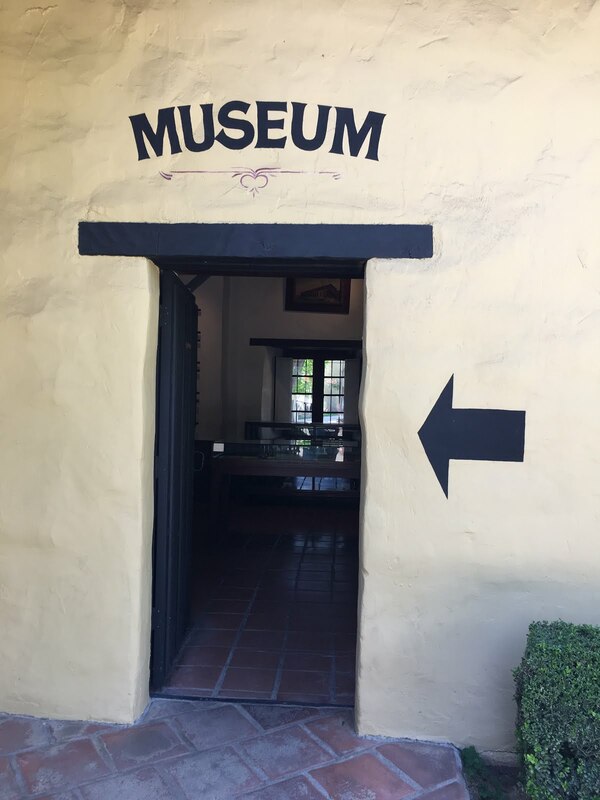 The Mission has been rebuilt several times, including after the 1971 Sylmar earthquake. The church is located on the left. Inside the long and narrow church. The very ornate altar at the front of the church, reflecting both the historic theology of the Catholic Church and the Baroque style of the time. Sign outside the church pointing to the Cemetery - and the what? 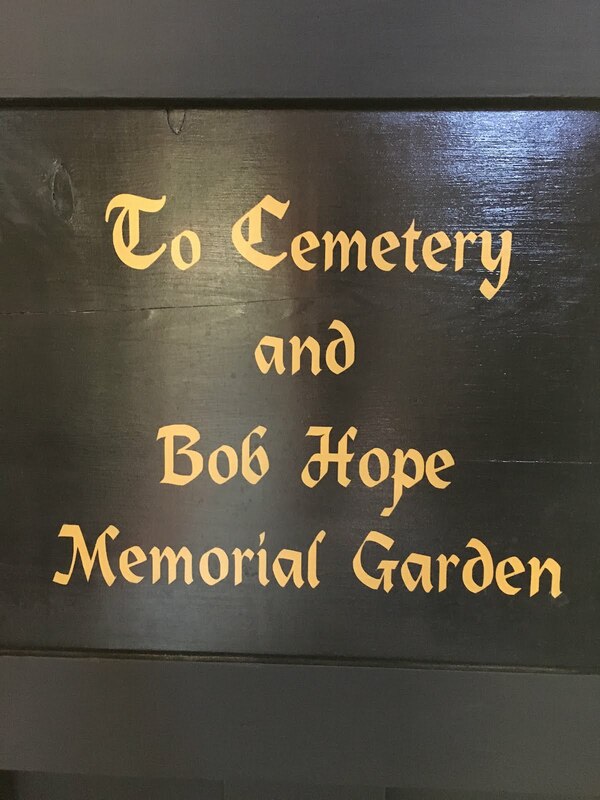 Bob Hope Memorial Garden. What's that all about? More on that next time in Part II.